Tee off at one of our eight golf courses at six locations! 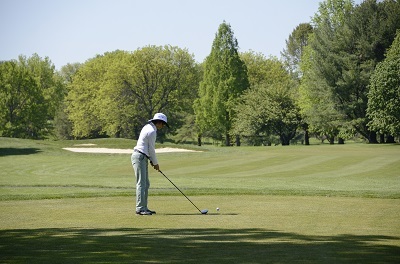 With five Championship courses, two 18-hole executive courses, and a nine-hole par three course, Park System golf courses are able to accommodate golfers of all skill levels. Learn more about Park System golf courses. Whether you’re looking for a night away from home or a memorable camping experience, the campground at Turkey Swamp Park in Freehold is the place to be. This family-friendly campground features 64 wooded campsites (52 which can be reserved) and opens April 1. Learn more about the campground. Get into the swing of spring on a playground. The Park System offers playgrounds at several parks and recreation areas throughout the county. These playgrounds provide children a place to play outside and build strong bodies and minds. 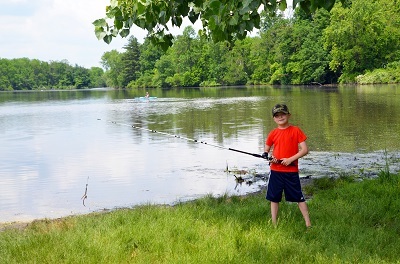 Fresh-water anglers can drop a line at the Manasquan Reservoir, Howell; Thompson Park, Lincroft; and Turkey Swamp Park, Freehold. Seven Presidents Oceanfront Park, Long Branch and Fisherman's Cove Conservation Area, Manasquan. Canoes and paddleboats can be rented at Turkey Swamp Park, Freehold. Boat rentals at Turkey Swamp are available weekends only from May 1 through June 16 and then daily until Labor Day and weekends only again from Labor Day through Columbus Day. Boat rental hours are 10 a.m.-4:30 p.m.
Also, kayaks and electric motor boats are available for rental at the Manasquan Reservoir, Howell. Motor boat rentals are from April 1- October 31 and kayak rentals are from May 1- October 31. Learn more about boating or fishing in the Park System. Take a walk, jog or ride a bike! With over 130+ miles of trails, the county parks have trails of all types, surfaces and lengths in many locations throughout the county. Learn more about Park System trails. 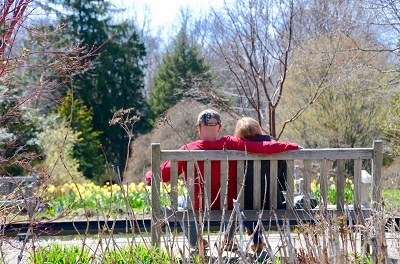 Learn all about gardening on a visit to Deep Cut Gardens, Middletown. Explore its 54 acres of gardens and Horticultural Library. Then stop by Holmdel Park and visit the Aboretum and see crab apple and cherry trees, rhododendrons and hundreds of shade trees. Stroll into the past by visiting one of the Park System’s two historic sites – Historic Walnford in Upper Freehold and Historic Longstreet Farm in Holmdel. Both offer unique glimpses into the county’s rich past.